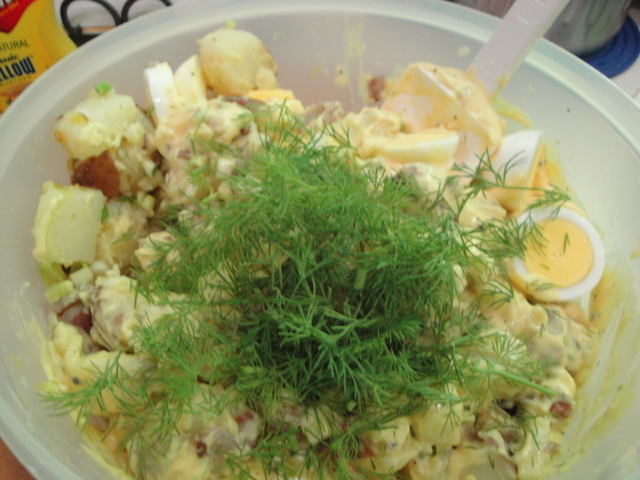 For years this recipe has been in my Tried & Liked recipe file titled Aunt Mary’s Potato Salad. It wasn’t until I asked permission to use it in this post that I learned that it was actually my mother-in-law’s recipe. Where she got it will likely go unrecorded, perhaps it was once on the back of a Miracle Whip jar. What I do know for sure is, that for my money this is the quintessential American potato salad. 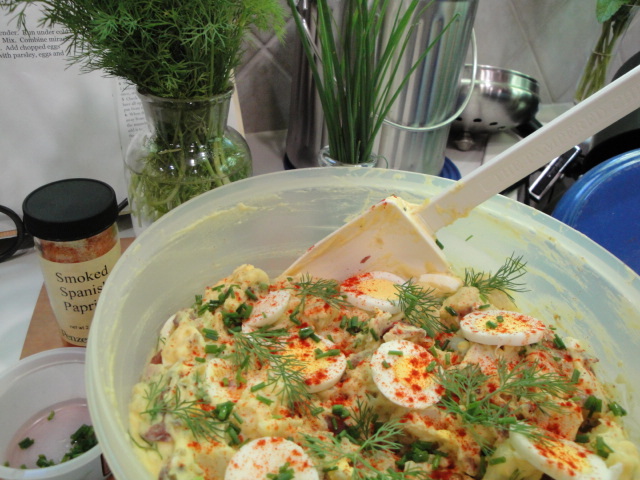 I have many potato salad recipes in my files and while many of them are very good, this is the one I always go back to for picnics, potlucks and when I’m simply craving potato salad. So on this Memorial Day out came this classic recipe once again. Thank you Grandma Alice! Now in the last few years I’ve lightened it up a bit by switching out some of the Miracle Whip for low-fat cultured buttermilk. I don’t think Alice would disapprove however as she is the daughter of a Land O’ Lakes butter maker and buttermilk Is an ingredient she loves. She and her son have been known to drink it by the class full. I’ve also traded the sweet paprika garnish for the more flavorful smoked Spanish variety. Other than that it’s the same recipe I’ve been making for going on 30 years. OK so early on I tried to mess with it. Our home is one of those split into the Salad Dressing camp and the Mayo camp. I’m definitely on the Mayo side of the fence in everything but this recipe. 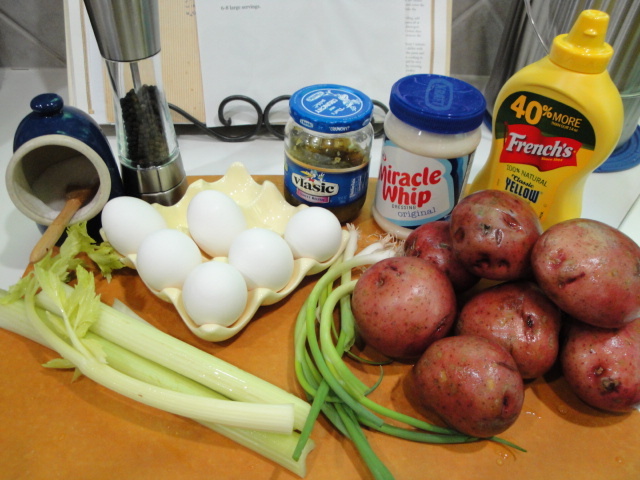 So, if you are a mayo person as well, let me save you some trouble-just use the Miracle Whip. I also tried to get fancy and use Dijon mustard-again great stuff but not in this one, trust me. The ingredients are mostly pantry/refrigerator staples. 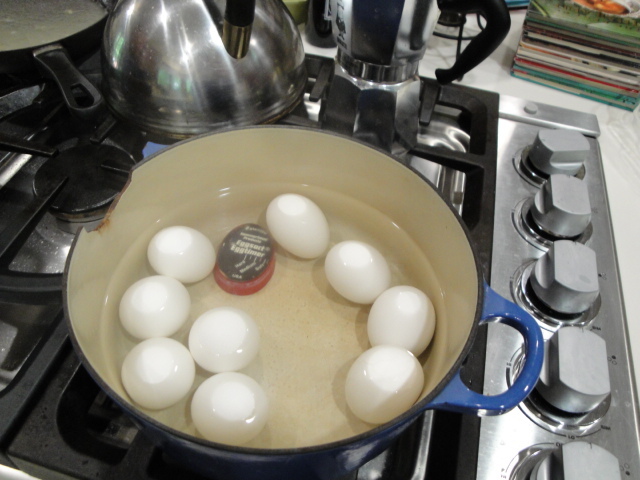 Start by hard boiling the eggs – I always make a few extra for the munchiers in my family. 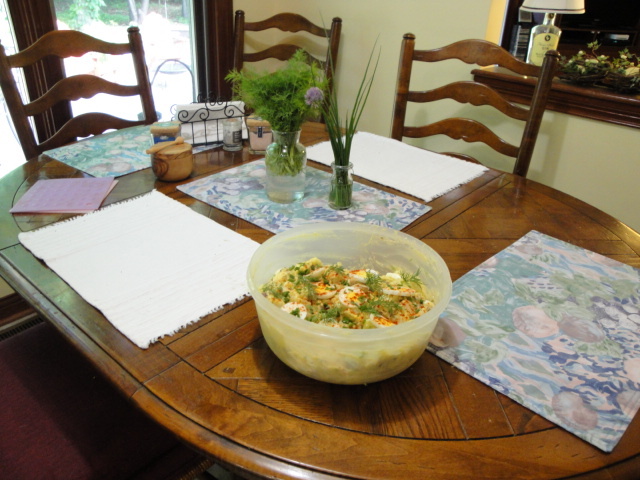 While I’m making potato salad I usually stir up some tuna salad as well. 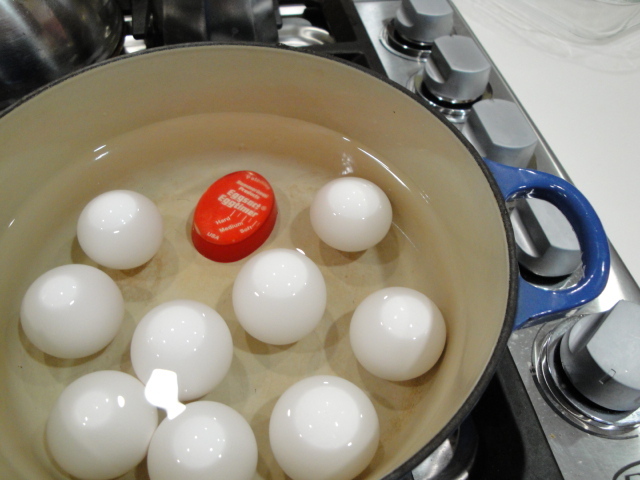 Yes ,there are many ways of properly hard boiling eggs-my favorite is the egg timer. It turns out perfectly cooked eggs every time (just as long as you keep don’t try to do too much multi-tasking and keep an eye on it). Also note that older eggs are easier to peel than super fresh ones. Next start cooking the potatoes. For potato salad you need a waxy potato that will hold it’s shape when cubed. I like red-skinned, but Yukon Gold’s work well also. They are a bit less waxy than red skinned potatoes but have an excellent flavor. The important cooking technique is to start them in cold water. 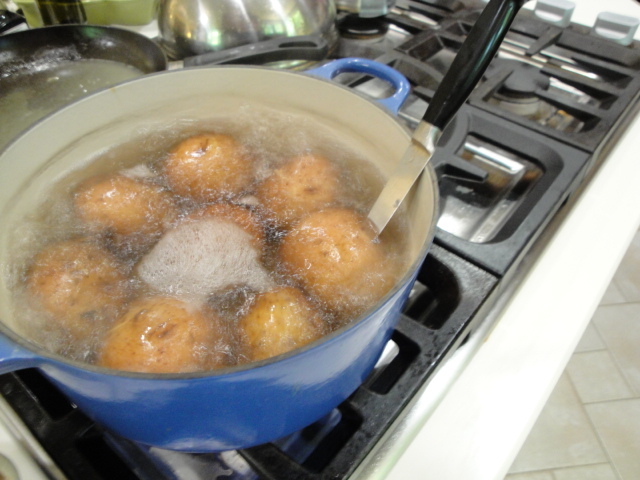 If you put potatoes into hot or boiling water, the outside will turn to mush before the inside is cooked. Add the salt either at the beginning or after the water comes to a boil. The eggs are done when the “timer” turns completely dark-so you do have to keep a watchful eye on it. Immediately pour off the hot water and add cold water from the tap until the eggs are cool to the touch (the egg timer will help you out here as well). 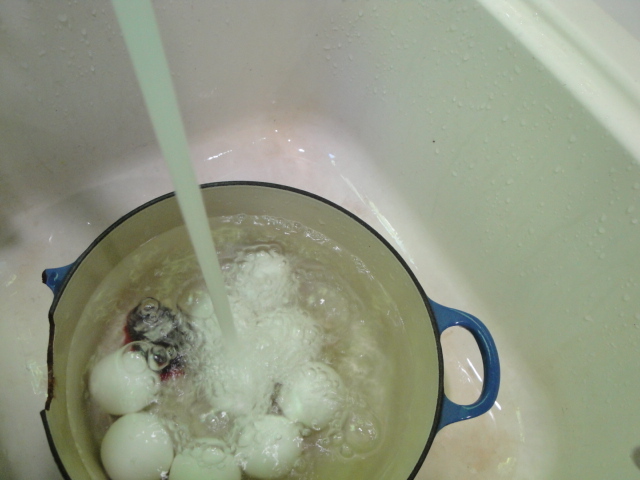 Then peel the eggs by tapping them against the side of the pot under water. The water going into the shell will aid you in achieving a beautiful smooth egg. 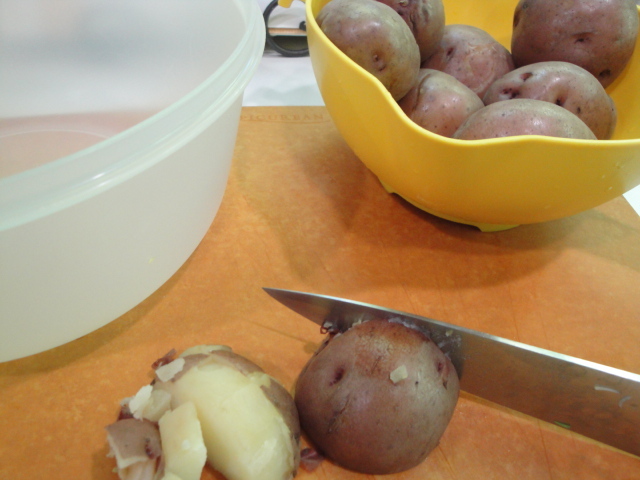 The potatoes are done when you can easily slide a sharp knife into the center with little resistance. 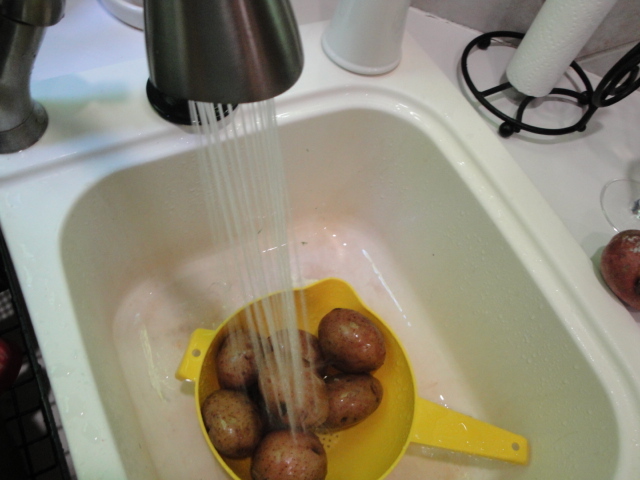 Pour the potatoes into a colander and cool under cold running water. While the potatoes are cooling you can start to chop the veggies. The size of the dice is up to you. Some people like the celery in bigger chunks so it is easier to pick out! I usually slice the stalk in half lengthwise and then cut into pieces about 1/4 inch wide. Once the potatoes are cool enough to handle, cube into bite size chunks. The original recipe calls for peeling them as well, but I like the flavor, fiber and ease of leaving the peeling on. 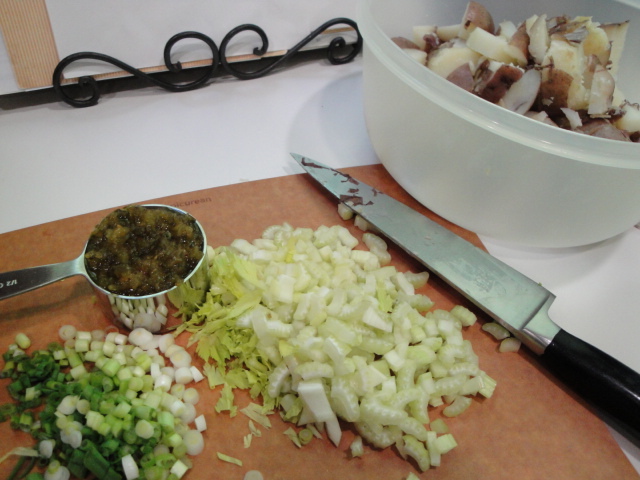 The original recipe also says the onions are optional, but I almost always add green onions/scallions. The relish for this one is sweet (I’ve tried to use dill because I love it in other dishes, but it doesn’t work in this one). 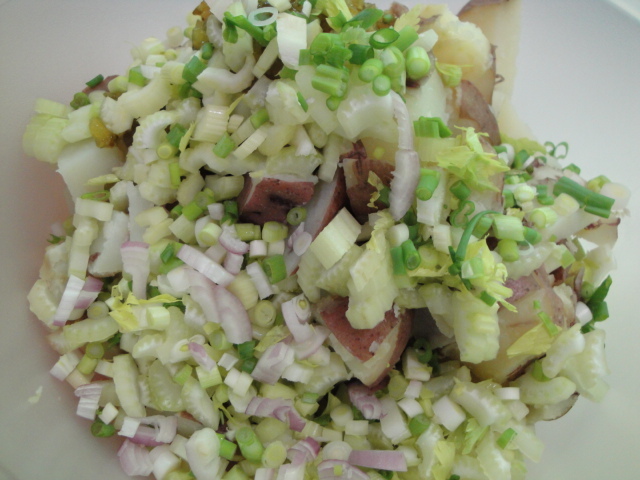 Gently mix the celery, onion and relish with the potatoes. 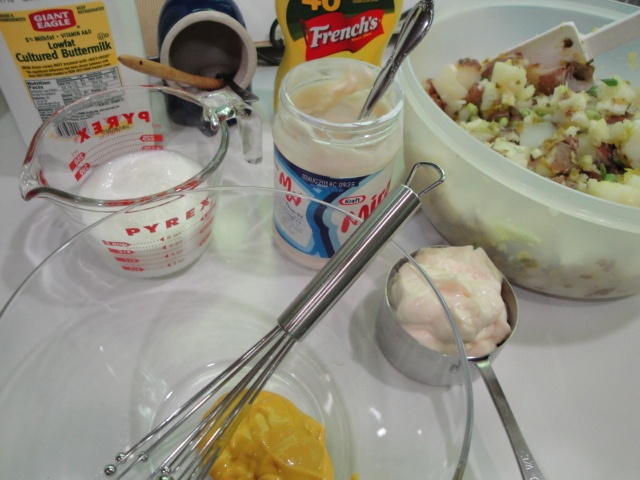 Mix the Miracle Whip, Buttermilk (optional), Yellow Mustard, Salt and Pepper. Pour the “dressing” over the potato mixture and add the sliced or chopped eggs. 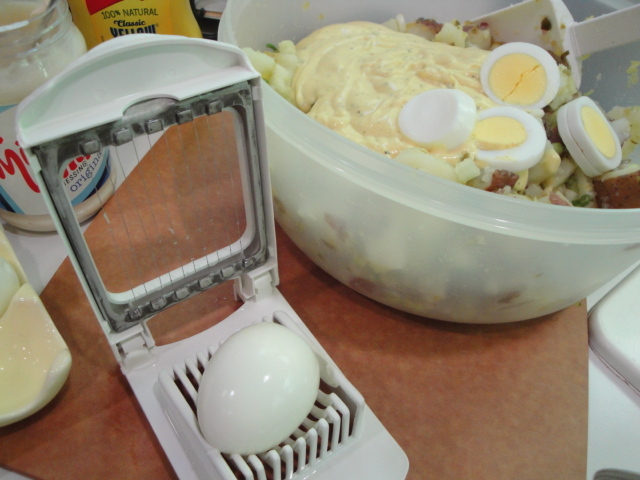 Yep, I love gadgets that work and like my egg timer an egg slicer does a fine job here. I leave the slices whole and let them break up as I stir them in. Don’t forget to save one or two for the garnish. The dill in my “garden” is going great guns at the moment so I’ve added a bit of that for a bit of fresh flavor. Like the dill, my chives are also in abundance so instead of parsley (which the bunnies and chipmunks have lunched upon) they become the extra bit of green on top to contrast the red of the paprika. 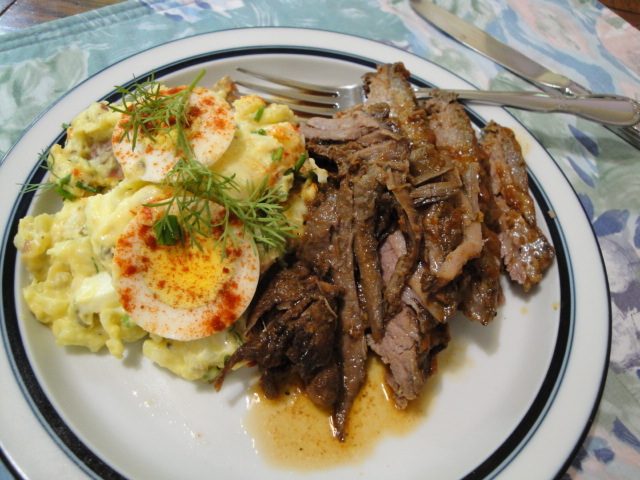 Coming soon – Brisket a great side to the potato salad! Thanks again Grandma Alice for sharing this one. Adapted from the original by Alice Einerson and perhaps her mother before her! 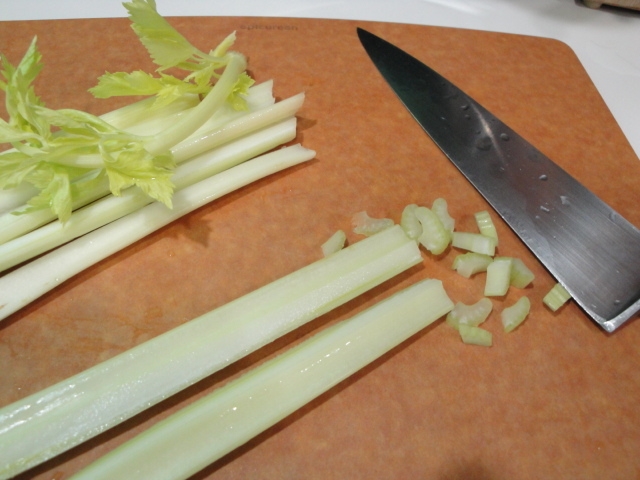 3 stalks celery, chopped as you like it – some would consider this ingredient optional! 1 ½ cups Miracle Whip – in recent years I’ve started to go with a 50/50 blend of Miracle Whip and cultured Low fat buttermilk but no substitutes for the Miracle Whip! 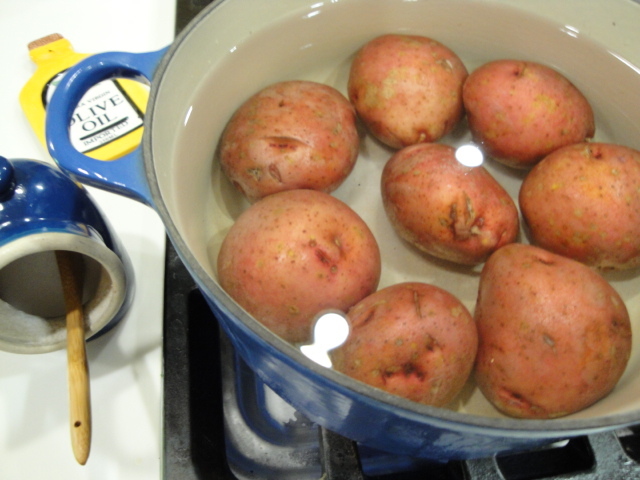 Place potatoes in a pot large enough to hold potatoes and cover with an inch or so of cold water. Add 2 tsp salt and bring to a boil. Boil 30-35 minutes until just tender. You can check by poking a paring knife into the potato. If it goes to the center with just a little resistance, they are done. Pour the potatoes into a colander and run cold water over them to stop the cooking. To peel or not to peel? The original recipe specifies peeling, but I like the flavor, fiber and other nutrients that come from the peel, so I save a bit of work and leave it on. When the potatoes are cool enough to handle, cube into the size you prefer. I leave it on the chunky side because that’s the way I like it. Add the onion, celery and pickle relish and mix gently. 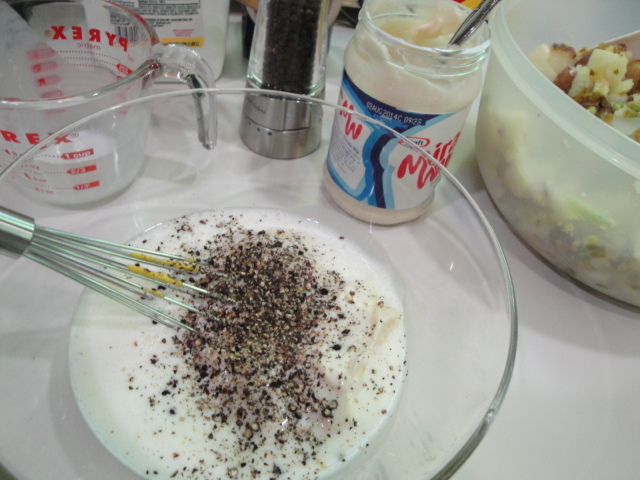 Combine the Miracle Whip, (buttermilk if you’re using it), mustard, salt, dill and pepper. Pour over the potatoes. Add the eggs, reserving some for garnish. Mix gently. Garnish with additional dill, chives or parsley, paprika and reserved eggs.